The success of the March 28 London strike was of vital importance to the ongoing joint pensions campaign. 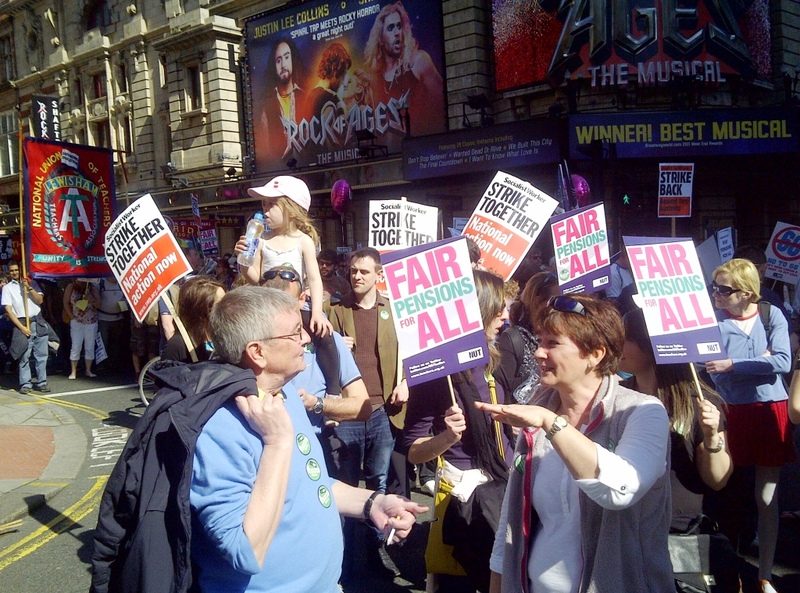 Central London was filled with around 8,000 NUT and UCU members on the march, many of them young staff angry at the idea that they should have to work on to 68. After the massive show of trade union strength and unity on November 30, this Government could not have believed its luck when, just a few weeks later, the leaders of unions like ATL and UNISON retreated and accepted the unacceptable terms of the ‘Heads of Agreement’ deal. Weakness has only invited further attacks. While giving even more away to the wealthy top 1%, Osborne announced in the Budget that pension ages will be rising even faster. A teacher in their 20s might now have to work into their 70s to get their full pension! This government of millionaires is just doing what their backers have asked of them - to bailout big business after the financial mess they created at our expense. Making us pay more for pensions - while employers pay less - also helps the profiteers taking over our services. Unions need to be fighting just as hard for their members, and for the millions that rely on public services, as the ConDems are for the millionaires. The response to the strike - with even the DfE having to admit it caused ‘significant’ disruption - was a clear answer to all the faint-hearts who said that trade unionists had no stomach for continuing the fight. Nobody takes strike action lightly, but, when it came to the crunch, thousands of London NUT and UCU members concluded that they had no choice but to do so. They knew that they just could’t afford to let the ConDems get away with their pensions robbery, nor give them confidence to push ahead with all their other attacks on our pay and conditions. But, while agreeing to strike, many London members were extremely critical of the decision to go for just a regional action. The NUT members’ survey results didn’t justify the decision. London was certainly not the only region that voted strongly in support of ongoing action. But it was left to the London NUT membership, and the hard work of local officers and school reps, to show that, given a lead, teachers will stand together. The Pensions Priority Motion for NUT Conference proposes a flexible formula of “bringing all other regions and Wales, in turn or together, into pensions action”. If NUT Conference votes to support regional action, then a clear and speedy calendar of rolling strikes needs to be announced. But Socialist Party Teachers believes that it would be much better to call out everyone together in a national strike, supported by other unions. Regional action may spread out the ‘pain’ of losing pay through strike action for a little longer, but to what effect overall? The lesson of the London strike was that many teachers felt regional action could be too easily ignored - and the press did, indeed, try to do so. Nobody wants to give up a day’s pay for the sake of it. Teachers need to know that their sacrifice is worth making - as it has been with the concessions won so far. It was national action that achieved it - and can do so again. We should try to bring the NASUWT on board - and discuss joint workload action too - but we cannot hold back on pensions strike action if the NASUWT will not agree to co-ordinate with the NUT and others who may well be prepared to do so - like PCS, UCU UCAC, EIS, NIPSA & UNITE Health. The action cannot be just a ‘one-off’. We need to set a calendar of ongoing action so that Ministers, and trade unionists, know we are serious. We should consider a two day strike to escalate pressure too. United national action is our most effective weapon. National strikes are also far easier to co-ordinate with other fighting unions, like the PCS, than regional actions. They are depending on the NUT to back a day of national strike action soon after Easter - and we have a responsibility to agree to do so. What about action on May 1st - with its significance for the trade union movement? That would certainly get publicity and attract wider union support. It would also be a date we can successfully build for from NUT Annual Conference.